Contorting the violin into new traditions, violinist/composer Jaron Freeman-Fox dances down the fine line between the beautiful and the ridiculous, while redefining what the violin can do. 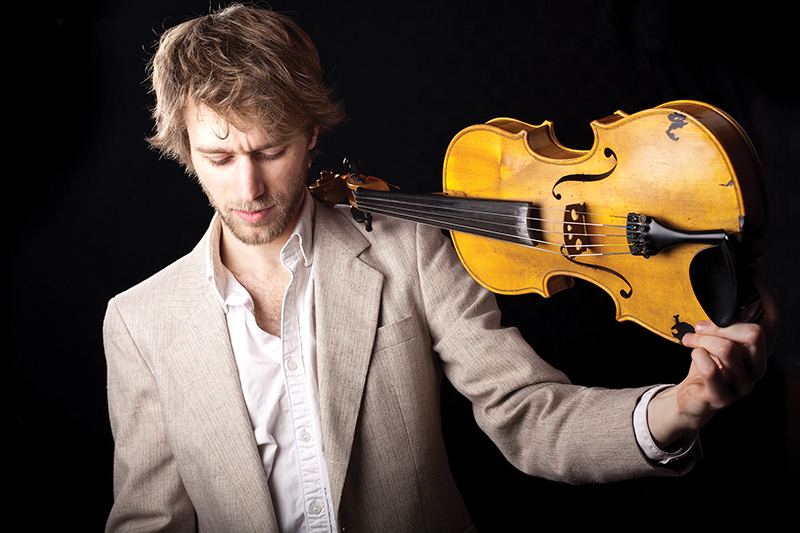 Having produced or played on over 40 albums (Jayme Stone, Autorickshaw, Josh Van Tassel) and toured the world many times over as a solo artist, frontman or collaborator with bands such as Delhi 2 Dublin, The David Woodhead Confabulation and Ben Caplan, Freeman-Fox fuses his roots of Celtic and bluegrass fiddling with his study of Indian classical music and jazz, while playing the 5-string violins of his late mentor; fiddle pioneer Oliver Schroer. Now, after 3 years of touring, writing, recording and spelunking with his fieryband Jaron Freeman-Fox & The Opposite of Everything, Jaron unveils his band’s new self-titled album in March 2013, fully demonstrating the breadth, depth, and general lunacy of this ensemble’s creativity. Folks may be intrigued by the fact that JFF has performed for 100,000 people and the young royal couple on Parlimant hill, or that the Canadian Embassy was kind enough (or foolish enough) to send him off to collaborate with a troupe of nomadic Rajasthani gypsies at the Delhi International Arts Festival, or that his debut album “Manic Almanac : Slow Möbius” won an Independent Music Award, or that he’s performed with Delhi2Dublin, Tanya Tagaq, and James Kudelka. Jaron however, is most proud of the fact that he’s broken three different fiddles on stage and zero bones, had his violin stolen by monkeys in Bali and got it back without contracting rabies, and has the honour of featuring his absolute favourite musicians in the world, in his band The Opposite of Everything.